should be given adult doses, whereas smaller children (2 – 5 years) usually need less. dose of bambuterol. Maximum plasma concentration of the active metabolite terbutaline is achieved within 2 to 6 hours. The duration of effect is at least 24 hours. Steady-state is achieved after 4 to 5 days of treatment. The plasma half-life of bambuterol after oral administration is about 13 hours. The plasma half-life of the active metabolite terbutaline is about 21 hours. Bambuterol and its metabolites, including terbutaline, are mainly excreted via the kidneys. Patients with renal failure and patients with severely impaired hepatic functions may display altered pharmacokinetics which would necessitate dose individualization. Bronchial asthma, chronic bronchitis, emphysema & other lung diseases where bronchospasm is a complicating factor. Probric@ should be used as maintenance therapy in asthma & other pulmonary diseases where bronchospasm is a complicating factor. 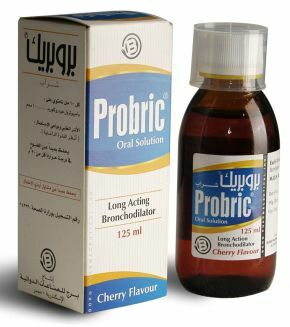 Probric® is dosed once daily, preferably before bed-time. The dose should be individualized . The recommended normal dose is 10 mg and because of difference in kinetics, 5 mg in oriental children. The recommended initial dose is 10 mg, the dose may be increased to 20 mg after 1 102 weeks depending on clinical effect. Because of difference in kinetics, doses above 10 mg are not recommended in oriental children . Recommended initial dose is 10 mg. Dose may be increased to 20 mg after 1 to 2 weeks. In patients with impaired renal function, the recommended initial dose is 5 mg which may be increased to 10 mg after 1 to Zweeks. – Adverse reactions which have been recorded are all characteristic of sympathomimetic amines. The intensity of the adverse is dose dependant. Tolerance to these effects has usually developed within 1 to 2 weeks. – Common side effects are headache, palpitations, tachycardia, tremor, tonic muscle cramps, urticaria, & exanthema. – Rare side effects include hypokalemia, nausea, sleep & behavioral disturbance such as agitation & restlessness. Hypersensitivity to any of the ingredients or to terbutaline. – As for all ~,-agonists caution should be observed in patients with thyrotoxicosis and in patients with severe cardiovascular disorders. such as ischemic heart disease, tachyarrhythmias or severe heart failure. – Due to the hyperglycemic effects of agonists, additional blood glucose monitoring is recommended initially in diabetic patients. – Potentially serious hypokalemia may result from ~,-agonist therapy. Particular caution is recommended in acute severe asthma as the associated risk may be augmented by hypoxia. The hypokalemic effect may be potentiated by concomitant treatments. It is recommended that serum potassium levels are monitored in such situations. – Bambuterol prolongs the muscle relaxing effect of suxamethonium (succinyl choline) due to the fact that plasma cholinesterase which inactivates suxamethonium is partly inhibited by bambuterol. The inhibition is dose dependent & fully reversible after cessation oftilration. – Beta-receptor blocking agents, especially those which are non-selective, may partly or totally inhibit the effect of beta-receplorstimulants. – Hypokalemia may resull from ~,-agonist therapy and may be potentiated by concomitant treatment with xanthine derivatives, steroids, and diuretics. – There is no definite evidence of ill-consequence during pregnancy. risk to the fetus . – Terbutaline is excreted in the breast milk but an influence on the child is unlikely with therapeutic doses. However, caution is recommended when administered to breast feeding mothers. – Store at a temperature below 30° C.
– Not to be used except under physician supervision.